From Guerrilla Games comes a new PlayStation exclusive: Horizon Zero Dawn, which mixes the past with the future. This is one of the most anticipated games of the year, generation, and for the PlayStation platform. Will this PlayStation exclusive be remembered in the future as a success or be forgotten in the past? Story: Horizon Zero Dawn takes place in the prehistoric era with future elements mixed in, with robotic dinosaurs and ruins. You play as a girl named Aloy who was born in Mother All, a mountain that is looked upon as a god; the Nora tribe asks an outsider by the name of Rost to raise Aloy making her an outsider as well. As Aloy ages her guardian (Rost) trains her how to hunt and fight. One day Aloy gets sick of being an outsider and decides to enter a challenge within the tribe called the proving; during this challenge disaster strikes and Aloy goes on a life-changing journey looking for answers as to what happened during the proving as she reconciles with her tribe and various characters throughout the land. Gameplay: Guerrilla Games does something innovative; they have created an open word action adventure game with RPG elements. 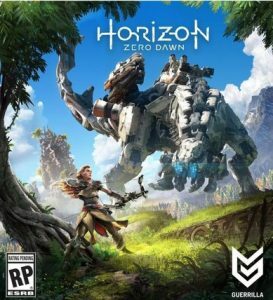 Playing as Aloy, you uncover the world that is very much alive and in no way dull in the slightest sense; if you are not sneaking around taking down robotic Dinosaurs you are collecting metal shards, gathering resources, and hunting to craft weapons and items. The weaponry in Horizon Zero Dawn is like no other, ranging from your average hunting bow, to weapons like the trip caster with electricity running through it which shocks the enemy and trips them. There are various items like this with various effects. Most of the gameplay is based around stealth, which works very well here; if you get spotted it’s very difficult to take on the enemies head on. When you are not in stealth mode you are climbing up mountainsides and sliding down zip lines. Conclusion: Horizon Zero Dawn is an addictive game, one that you cannot stop playing once you pick up the controller; when you do put it down it’s all you can think about, and it’s all you want to talk about. Guerilla Games and PlayStation have captured lightning in a bottle with this title. This is a game that you do not want to miss out on and is a must buy.